Origin and Habitat: Sonora: Yecora, Mexico. Altitude 1.500 to 2.000 m.
Habitat: Grows on volcanic slabs of rock. In habitat, the plants contract considerably during the dry season, sometimes pulling down completely under the soil. Their flowers can push up through the dirt. 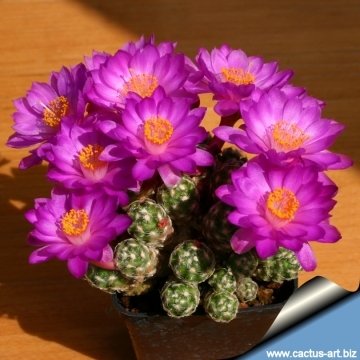 Description: Mammillaria saboae is a low clustering, mat-forming geophyte succulent. Stem: Tiny, round, soft-bodied, 10-20 mm in diameter, 20-40 mm tall. axils bare, without latex. Axil without any wool and bristles.. Radial spines: 18 - 27, glassy white with a yellow base, thin, a little curved, 2 to 6 mm long. Flowers: Large 4-6,5 cm in diameter, dark lilac-pink to pinkish magenta, larger and deeper coloured than the type, stigmas yellowish, blooming in May. It has a reputation of being shy to flower, at least when on its own roots. Fruits: The fruits mature inside the plant and remain for years sunken into the stems, as in the type. 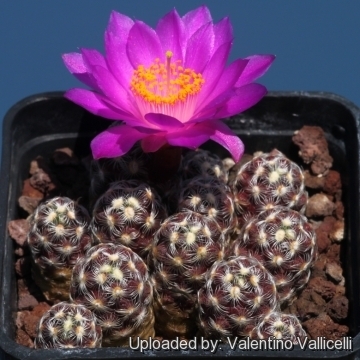 Mammillaria saboae Glass: (ssp. 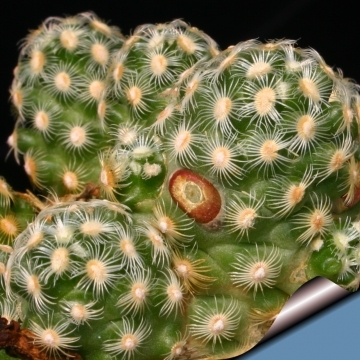 saboae) grows in clumps and has 17-25 radial spines per areole. The flowers are about 4-5 cm across. 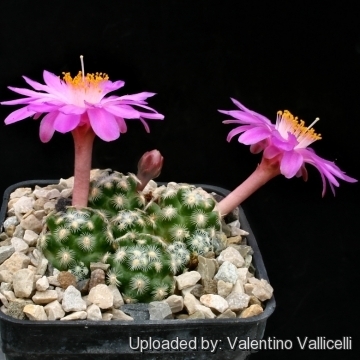 Mammillaria saboae subs. goldii (Glass & R.A.Foster) D.R.Hunt: grows only solitary stems and has 34-45 radial spines per areole. The flowers are about 4-5 cm across. 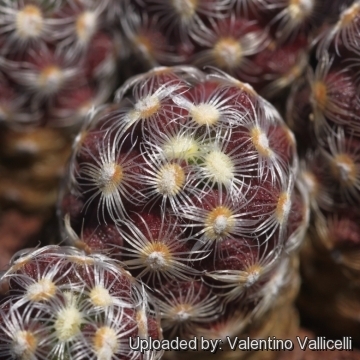 Mammillaria saboae subs. haudeana (A.B.Lau & K.Wagner) D.R.Hunt: grows larger than the former two subspecies, up to 4 cm high, about twice the size of the type,.and grows in clumps. 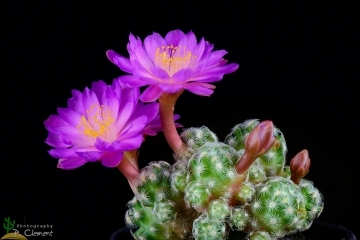 It has 18-27 radial spines per areole, and large flowers 5-6 cm across. 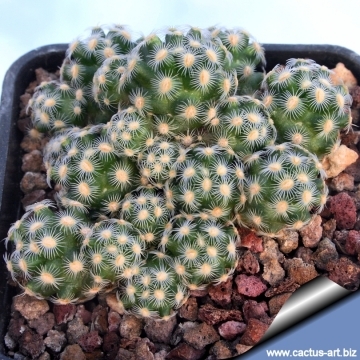 Mammillaria saboae subs. roczekii W.Rischer & Wolfg.Krüger: The stem is larger, usually solitary (or rarely clustering from the base) with large flowers and yellow stamens. It comes from Canatlán. Cultivation and Propagation: Clustering in cultivation and easily flowered it is not really easy. It has a thick tuberous root system and is susceptible to over-watering, and it's especially prone to rot. Therefore, underpot in a shallow pot with good drainage, filled with a very open mineral-based potting mix, and only use the smallest diameter pot that will accommodate the plant. . Plants need to be kept dry in winter. Feed with a high potassium fertilizer in summer. Can be sunburned if moved from shade/greenhouse into full sun too quickly. During the spring it may be able to take full sun until the heat arrives at the end of spring. In an area that has hot afternoon sun, it may be able to take full morning sun, but requires afternoon shade or afternoon light shade. 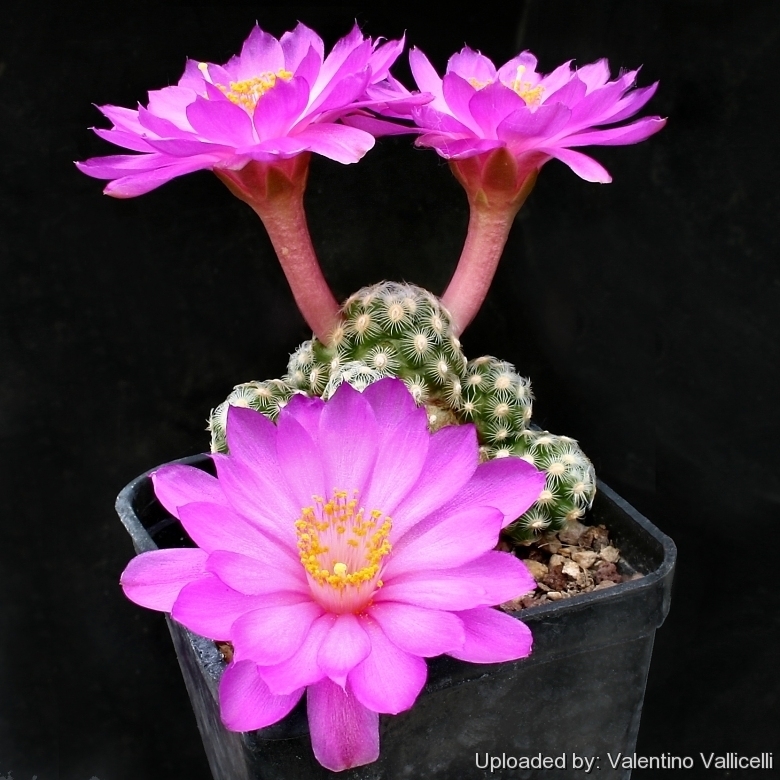 If grown correctly, it will reward the grower with generous displays of huge pink-violet flowers. 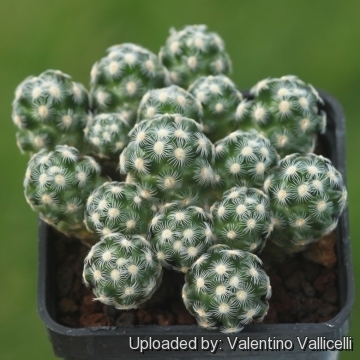 Initially this species appears easy to cultivate, but the grower should not be surprised if clumps suddenly dry up, especially in the winter season. Hardy to -5°C. Propagation: Seeds, division off larger clumps or graft. Seeds can be sown in the spring or summer. The seedlings should not be disturbed until they are well rooted, after which they can be planted separately in small pots. To make cuttings wait until the offsets that appear at the base of old clustered specimens are 1/3 the size of the parent and then detach and plant.